This giveaway has ended. Thanks to everyone who entered! Thanks to its stunning Retina display, Apple’s iPhone makes a perfect portable screening room. I use mine to view dailies while on location, to reference rough cuts while working with sound effects designers, and so on. I’ll even use it to show-off relevant videos while giving impromptu elevator pitches. Unfortunately, as awesome as the iPhone’s screen may be, its audio playback sorta blows…specifically, its low volume. However, one company has created a clever iPhone case that can help turn things up to 11. Allow me to preface this completely unbiased iPhone case review by saying, I really hate iPhone cases. Like many Apple products, the iPhone is a true work of art. Every curve has been designed and refined to accentuate its subtle beauty. I’d frame it if it wasn’t busy helping me make movies. Sure, I understand the need to protect your investment, but covering an iPhone with some flimsy piece of leopard printed plastic is a bit like wrapping the Mona Lisa in tinfoil… you know… so it’s safe. Now, where was I? Oh yes… I really hate iPhone cases. So, imagine my surprise to discover that I LOVE the Bandshell iPhone case! With versions for the 5/5S and the 5C, the Bandshell iPhone case addresses a major shortcoming of the iPhone’s design — its unfortunate speaker placement. For some reason, Apple positioned the iPhone’s speaker on the device’s bottom edge. So, when you’re watching videos (dailies, rough cuts, etc.) on your iPhone’s screen, the speaker is facing away from your ears! In quiet locations, this isn’t a problem. But, if you’ve ever tried to watch and listen to your iPhone in a noisy environment (like most film sets), you know it’s an exercise in frustration. At first glance, this case looks like most — a very snug plastic and rubber shell that protects the back and sides of your iPhone. The Bandshell works its volume-boosting magic by providing a small plastic door that slides out from the back of the case, and redirects your iPhone’s audio towards your ears. When not in use, the door disappears back into the case. Simple as that! In fact, it’s such a simple idea that I wondered why other case manufacturers hadn’t already ripped off the design… and then I noticed the design patent notice on the Bandshell website. Looks like this protective case is well protected! Curious how much volume you gain with a Bandshell case? I was wondering the same thing, so I performed an entirely un-scientific experiment that should be completely ignored. But, as long as you’re still reading, here’s what I did. I created an mp3 audio file containing a steady tone, and played it back on my iPhone 5S. I measured the playback volume level using my Zoom audio recorder (positioned about 6 inches away). Then, I repeated the same steps with the Bandshell’s sound door extended. According to my readings, at that distance, the volume level rose a full 4dB. In truth, it’s not a huge change, but it’s enough to make an effective difference. That said, if you’re trying to hear your iPhone in the middle of Grand Central Station, those 4dB aren’t going to help much. 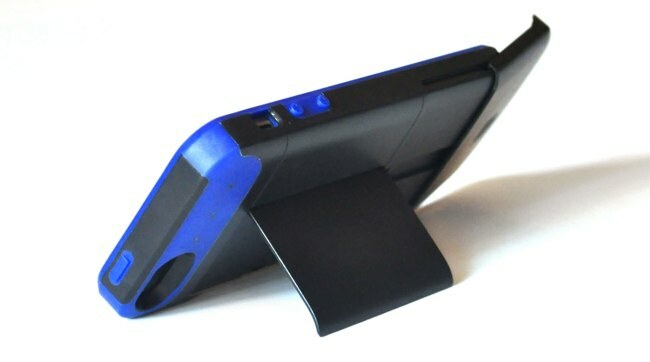 In addition to boosting your iPhone’s audio, the Bandshell case also hides a terrific, pop-out kickstand! Sweet! With this case’s two-feature combo, you can set your iPhone down on a flat surface at a very nice viewing angle while actually being able to hear it! The Bandshell does have a couple minor drawbacks. While inside the case, your iPhone’s volume and sleep buttons lose their ‘click’ and become a bit spongy. If your iPhone isn’t seated just right inside the case, the sleep button can easily be pressed accidentally. Lastly, the cutout revealing the silencing slider is a bit small for a big-mitted dude such as myself. While the Bandshell is certainly a nice looking case, it will never match the beauty of the bare iPhone. That said, that same observation could be made of just about ALL iPhone cases… so, I suppose the point is moot. These really are minor issues, especially if you’re already using (and used to) other iPhone cases. In conclusion, if I’m going to hide my treasured iThing in a case, that case had better add more than it takes away. It had better improve my iPhoning experience. In other words, it had better be exactly like the Bandshell. If you need to turn things up to 11, this is the case for you. The Bandshell is available for the iPhone 5/5S as well as the 5C. It comes in a variety of two-color combinations (i.e. blue & white, red & black, etc. ), and retails for $29.99 ($25 on Amazon). It’s giveaway time! Woohoo! I’ve got 5 brand new iPhone 5/5S Bandshell cases to giveaway to HHH readers!